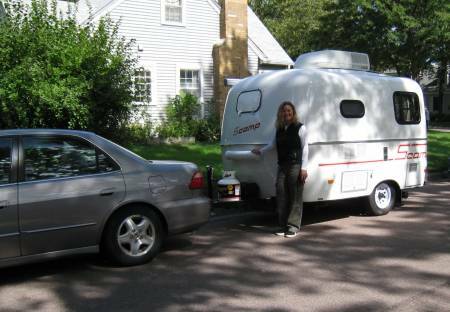 She's fully outfitted with a tiny bathroom and kitchen - totally self-contained for road travel. I daydream about a TD or another type of small trailer, but I drive a very small 1974 MGB so I'm still in hotels, but maybe one day. Your little rig is sharpe. Lawnvett - Your car is adorable. I now have a Honda Pilot, the big SUV, and it's more than powerful enough, but it's great because I also now have a 60-pound dog so we've got more gear and needed more room. I hope you get that trailer sooner than later.